What I used to hear from friends was that their fathers were very strict. 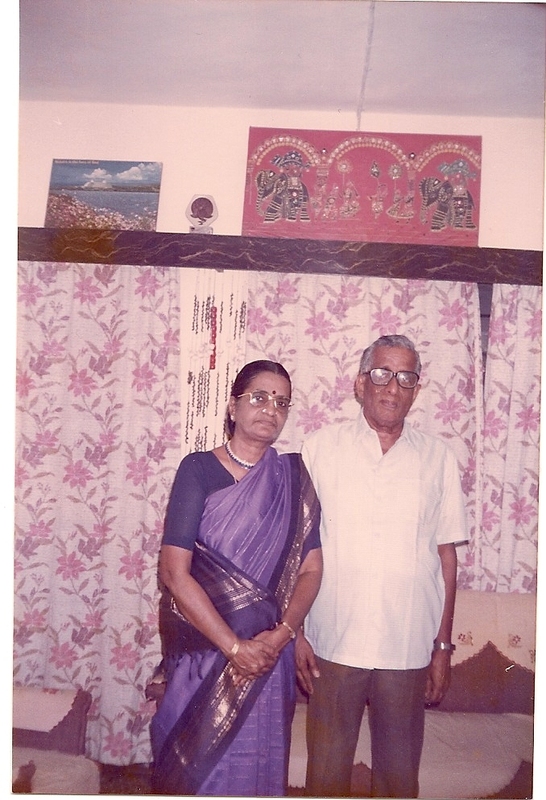 And I loved to boast to them about my gentle, affectionate and friendly Appa. Father was our buddy – he wouldn’t raise a feather – not even raise his voice - at us when we were kids. That way he was a very special father and in his loss, we feel a big vacuum in our hearts! What strikes me most about my father is – he was the most normal, down-to-earth person – one who was a ‘normal’ human being – simple to the height of being termed a country bumpkin, innocent to the extent of being gullible, straightforward to the extent of being ridiculed – with no frills or fancies but with fads and foibles and idiosyncrasies aplenty! A late child with siblings eight and ten years his senior, he was a pampered kid who had perfected the technique of having his way by rolling on the roadside and yelling with his mouth open wide like the Panama Canal. A ‘mamma’s boy’, he chose to stay home and feast on home-made curd rice exclusively prepared for him while the rest of the family honored a lunch invitation. These stories he narrated to us when we were kids. In the family of gold-medalists, he was content with the 40 percent marks he scored in Mathematics in his schooldays – he was a ‘normal’, average student. But not for long – he went on to bag the gold medal for B.Sc. (Hons.) and again for Engineering – so you could say he was just being a ‘normal’ member of his ‘intelligent family’. That he’d attribute this transformation in academic achievements to the change of ‘grahas’ in his horoscope is a different story. His life pattern followed that of any ‘normal’ person hailing from the upper middle class family – a decent job, a happy and contented family with its values intact. He never resorted to unscrupulous ways to climb the ladder of success or amass wealth, though opportunities fell onto his platter often. He had the strength of character to resist temptations. An honest, uncorrupt, sincere and hardworking officer, he climbed the ladder of his career with steady, ‘normal’ steps. His ‘normal’ middle class tendency of saving every penny possible might have earned him the label of ‘miser’ from some quarters. But those in the know knew he was only being thrifty. He would unflinchingly spend on food and his family but never on his own clothes or accessories. If he had to go out alone, he’d choose to walk the distance or take a bus. But he’d play chauffeur to his better half and children without a mutter. He was rated a clumsy (read extra-cautious) driver but it is to his credit that he never had a single accident during the forty five years he drove the car! Appa was not the archetypal father dreaded and distanced by the members of the family. 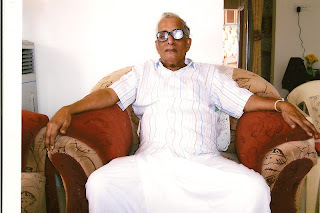 He was the most adorable father – incapable of uttering a harsh word to the children – always protective, caring, appreciative, and ambitious for them…. He’d baby-sit patiently and even sing lullabies and narrate stories through the various stages of our childhood. Oh yes, he would also forget his children in his car parked in the nearby market and walk home with the purchases! He was obsessed with academics but he didn’t know the ABC of sports! He loved it when we romped home with the first rank. But when others spoke highly about his son’s awesome serve or fantastic bowling figures, he’d wear a ‘what’s so great about it’ look! As a grandfather, he gloated over the academic achievements of the younger generation. But then he would listen to their animated discussion on sports with a dead-pan expression – blatantly revealing his ignorance. A simpleton to the core, Appa never bothered to pick up sophistication. Even when we had guests for dinner, he’d start off even before them in spite of our secret gesticulations and give us a wicked grin when he caught our eye! He was like a naughty child. He had his mood swings too – there were times when he would remain as silent as a stone when visitors were around. My mother would nudge him to join the conversation and he would retort, “What is there to talk?” But then there were times when he would talk nineteen to the dozen with the same persons! A wizard at dates and numbers, Appa started forgetting the same in his old age. Like any ‘normal’ old man, he had his trysts with doctors and medicines. He had his share of worries – genuine and unfounded! 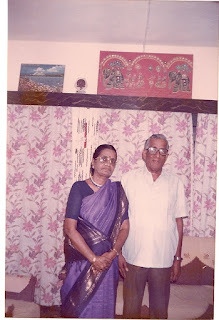 Unlike many Indian husbands of his generation, he loved to cook and help my mother in all her chores.